The end is in sight now, so I have chosen the final items that I am going to paint up for the game. 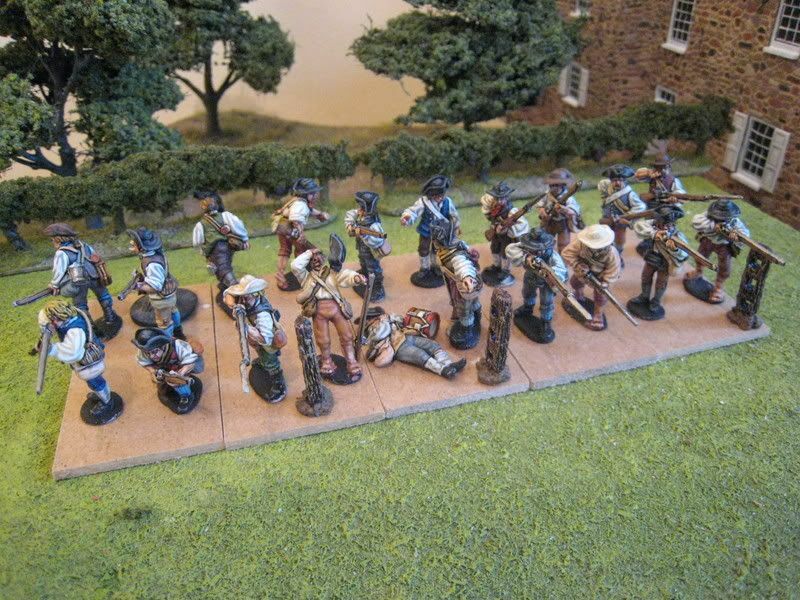 The light infantry and most of the grenadiers are finished. 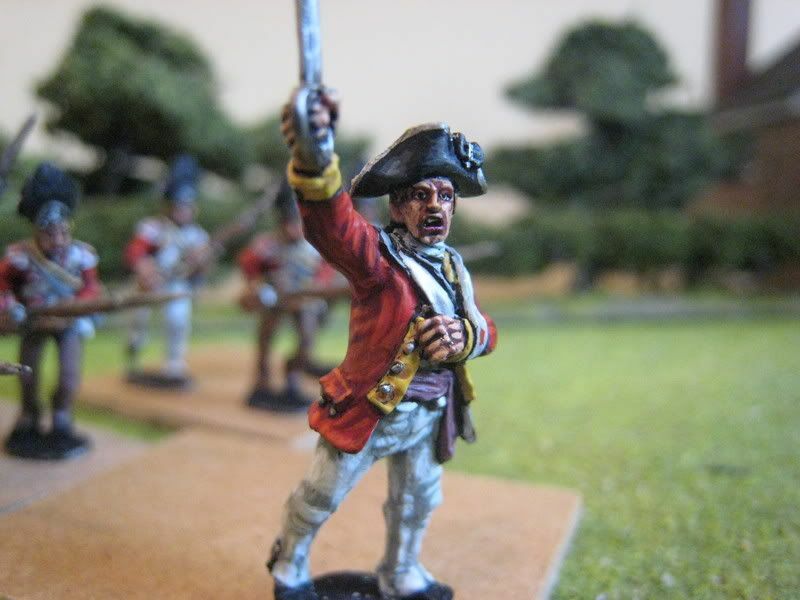 Any concern I had about not having the light infantry "doubled up" in both close- and skirmish-order bases has been dispelled by the fact that I, apparently, will be commanding the British light infantry at the game. I intend to use the brigade as elite shock troops, to keep them in close order and try to win the battle all by myself. Consequently, I don't need any lightbobs on skirmish bases...Problem solved. 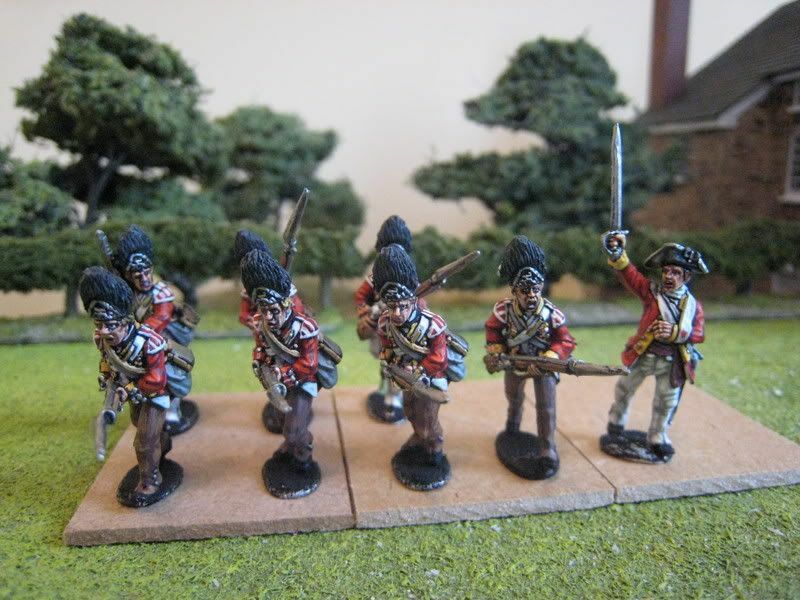 I just have 4 highland grenadiers to finish off and then all the things I had to paint for the game are done. When I finished the last of the lightbobs last Sunday morning I thought about what I could usefully do for the remaining 2 weeks. Of course a game two weekends hence does not, in fact, give you 2 solid weeks of painting as you have to factor in varnishing and basing, which means that realistically I'm going to have to down tools next Tuesday. 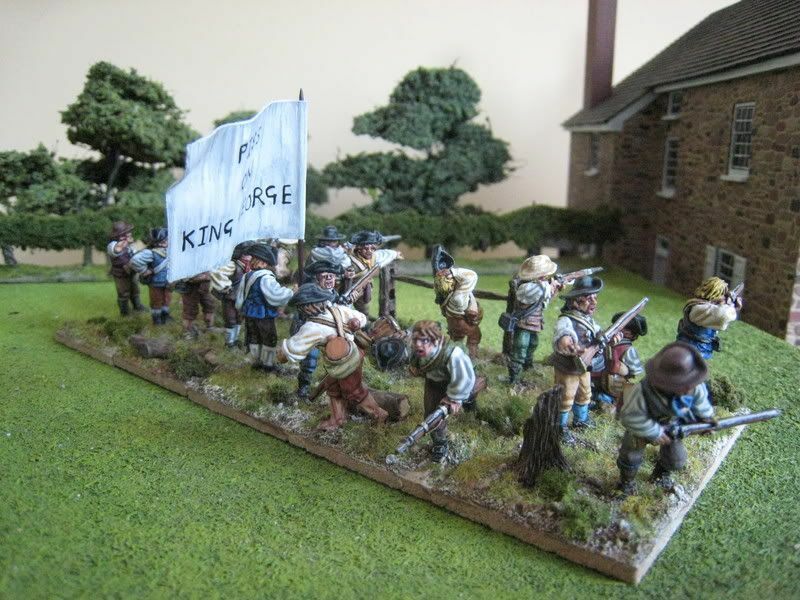 So whilst I toyed with the idea of trying to paint one of the 3 British line regiments that I don't as yet have, I rejected it as being too onerous. In any event, it will be good to give the substitute regiments an airing and ultimately A N Other British line battalion is not going to be noticed on the table; better to do something with more visual appeal. 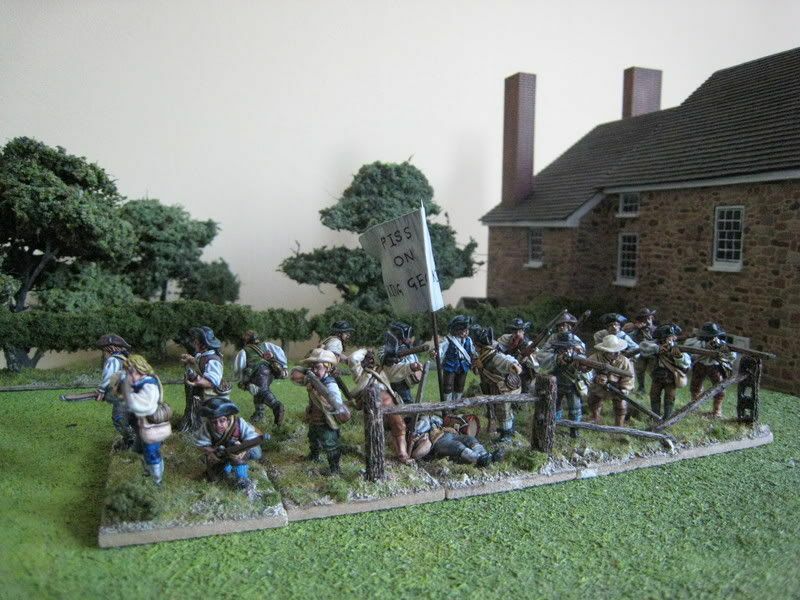 So instead, I decided upon a second limber for the British artillery (see the pic above) and having a crack at Smallwood's Marylanders, which was on my original list as something I'd wanted to do. 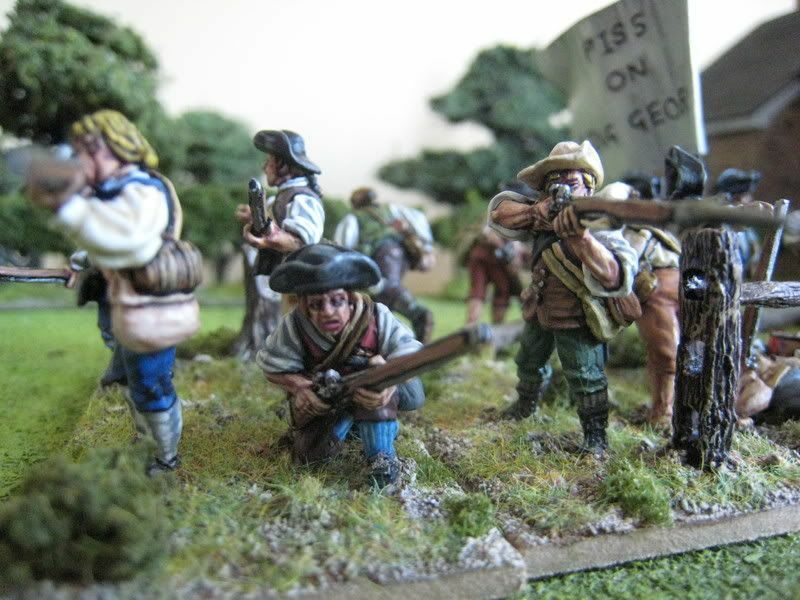 Also, if I have time, there is a pack of Front Rank civilians with spades, picks etc which would be suitable to have working on the Brooklyn fortifications. 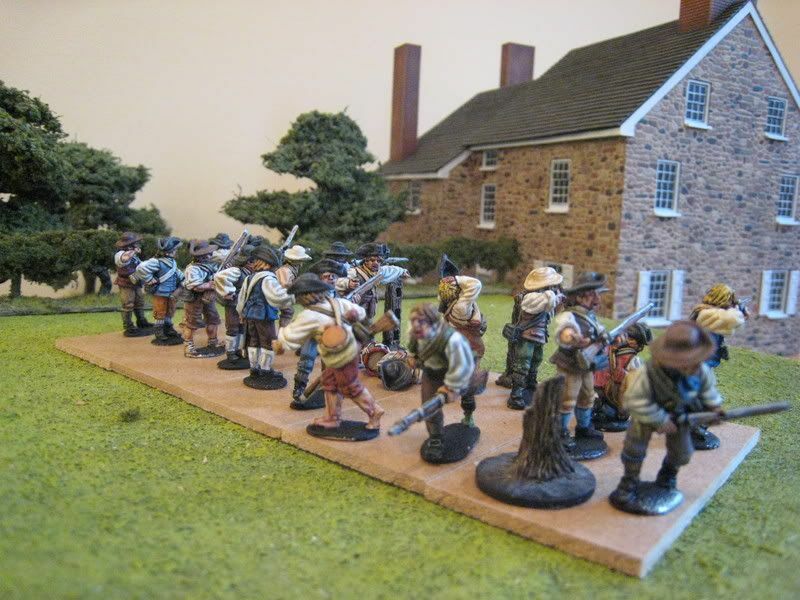 But the focus will be on the Marylanders, and by using the hunting-shirted North Carolina troops I painted over the summer I only need to paint 12 figures - the command stand in red faced buff coats and some more hatmen in brown shirts and buff breeches. This unit should stand out because I'm going to paint a flag based on Lord Baltimore's coat of arms. 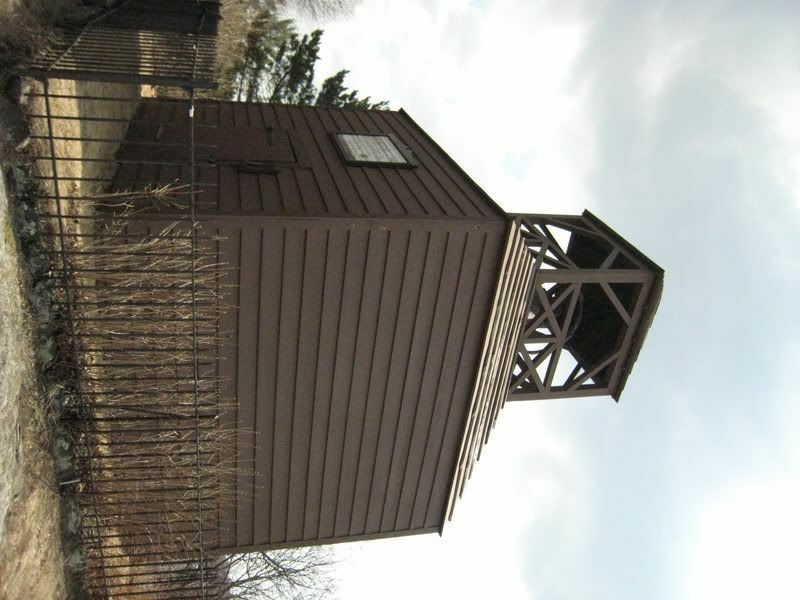 The Old Belfry in Lexington was built in 1762 and originally stood on a small hill adjacent to the village green, on land owned by one Lieutenant Jonas Munroe. In 1768 it was moved, apparently because Munroe was demanding increased payments for the Belfry being on his land, to a new position on the green itself. 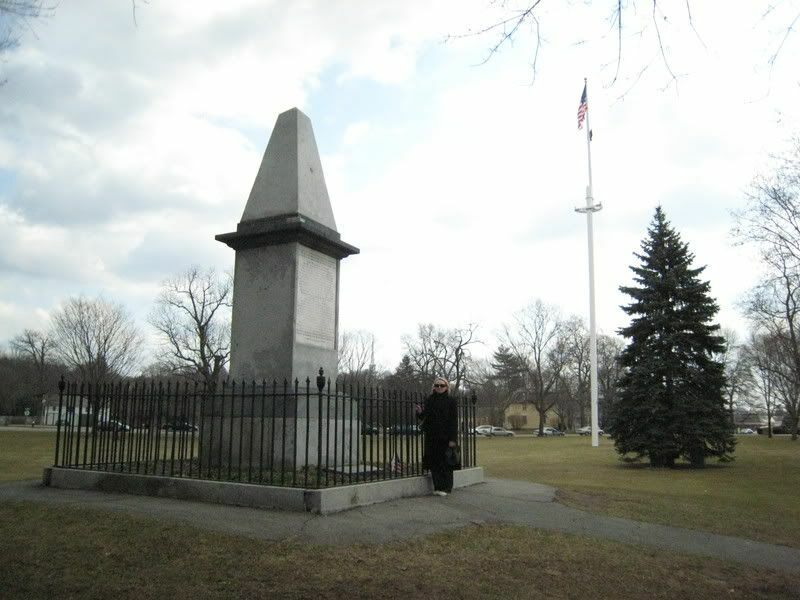 Between the hours of 1 and 2am on 19 April 1775 the bell was rung to summon the 75-odd men of the local militia, after Paul Revere and Willam Dawes had alerted the village that the regulars were on their way from Boston. 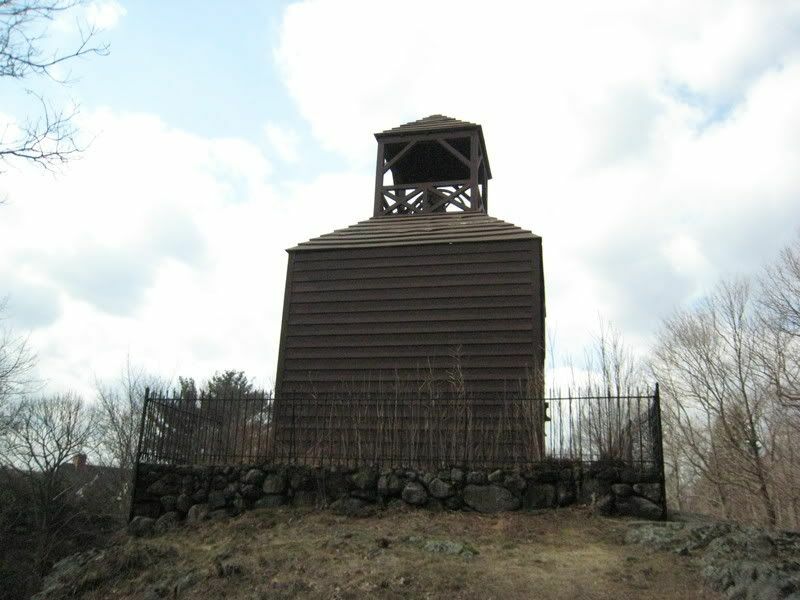 In 1891 the Belfry was moved back to its original position on the hill. It was destroyed in 1909 (either in a gale or by fire) and an exact replica built a year later. 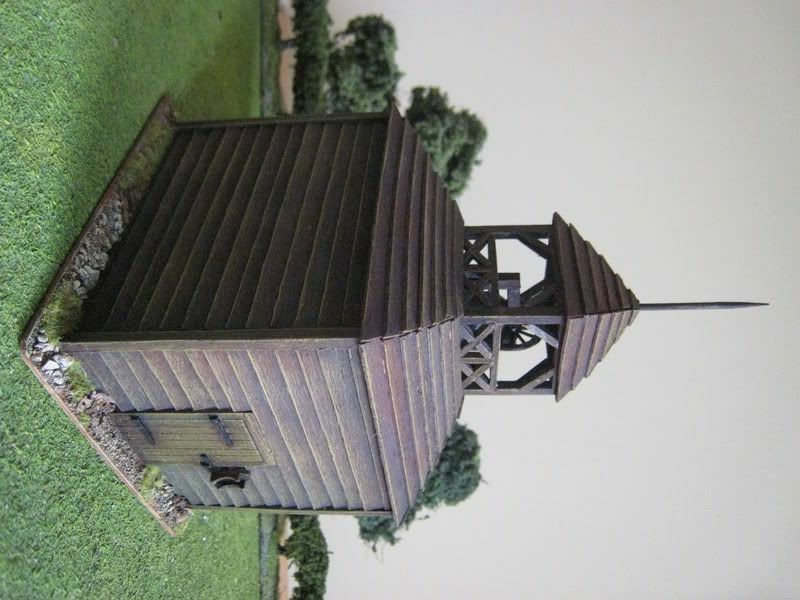 Wargaming chum and talented chap Richard Watts (aka "Eccles") made a couple of scale models of the Belfry and very kindly presented one to me. It's made of balsa wood and contains a bell hand-made from gree stuff. Eccles and I scoured the net (or, in my case, wedding cake decorations) to find a suitable bell, but in the end Eccles made them himself. I think the end result is outstanding. There are lovely touches of detail (not least the ropes on the bell) and the basing is very effective too, with a few leaves scattered around. From recollection, the size looks pretty much spot on. So I'm terribly pleased with this little gem and it will feature in the Long Island game. The "real life" photos were taken on my trip to Boston in March and include two of Battle Green. This unit has been "in development" for some weeks and was finally finished this afternoon. 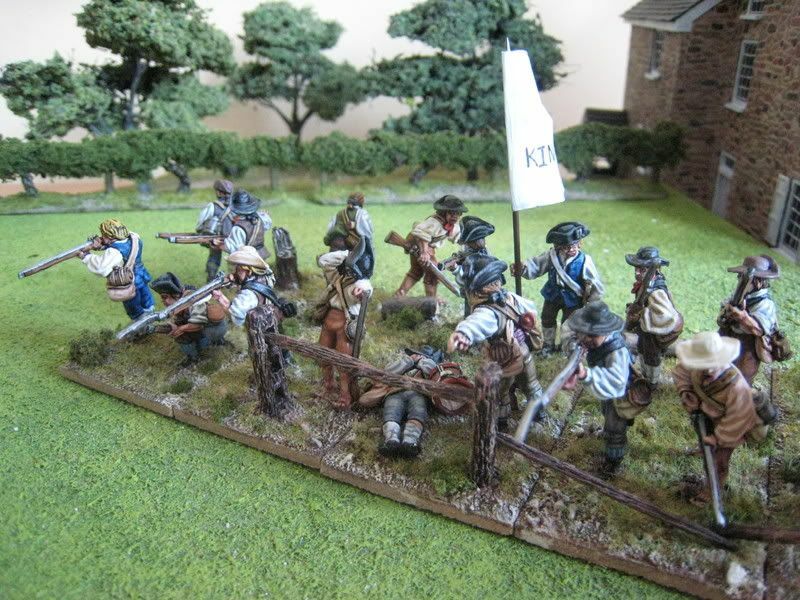 It uses the most recent Perry Miniatures Southern militia packs, particularly the "nervous militia" and second militia casualties packs. I painted most of the figures in August but did not finish the last two until the middle of September. Then I had trouble working out how to base them. I did think about having the retreating figures on single bases but I decided quite early on that I wanted to have a coherent unit that represented a collapsing militia firing line. In order to put some distance between the firing line and the retreating second rank, I based the figures on larger bases than the usual 36mm x 50mm. These bases keep the same forntage but the depth has increased to 70mm. This extra depth allowed me to build in some scenic features, such as logs, the odd tree trunk and a fence at the front. 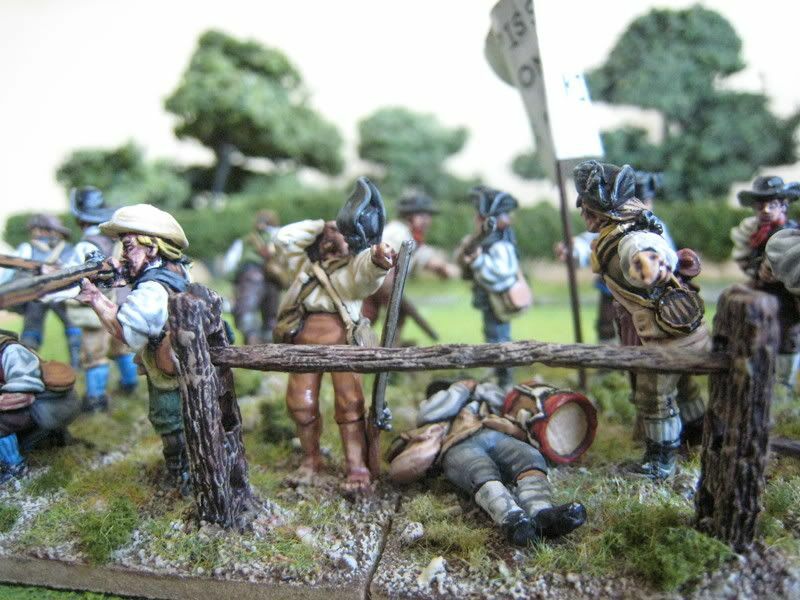 I had in mind a situation where the militia have taken up position at a a broken fence. The posts are glued onto the bases but the horizontal slats are (currently) loose, as they straddle the bases and so cannot be glued into place. The idea for the flag came to me whilst driving in the Cotswolds some weeks ago. 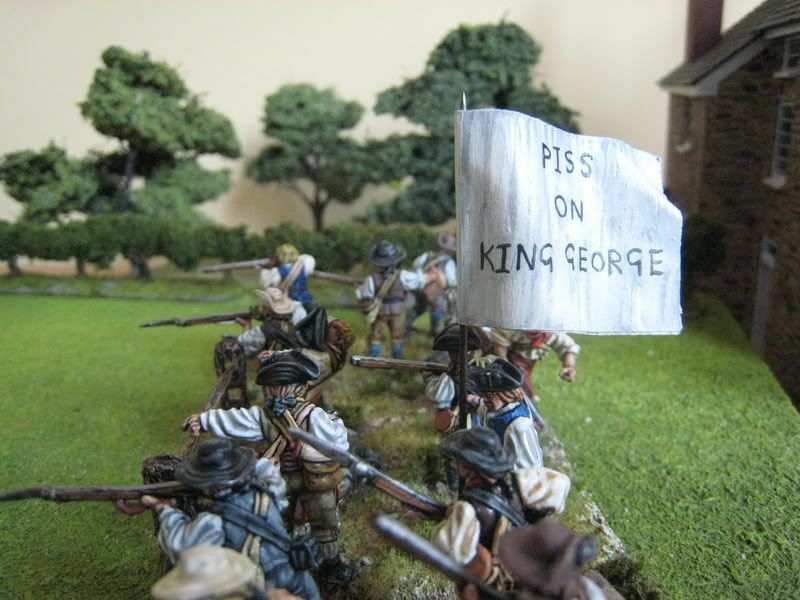 I was thinking about having a flag that said either "Piss on the British" or "Down with King George"; both are rather apocryphal but I'm sure variants existed somewhere during the war. 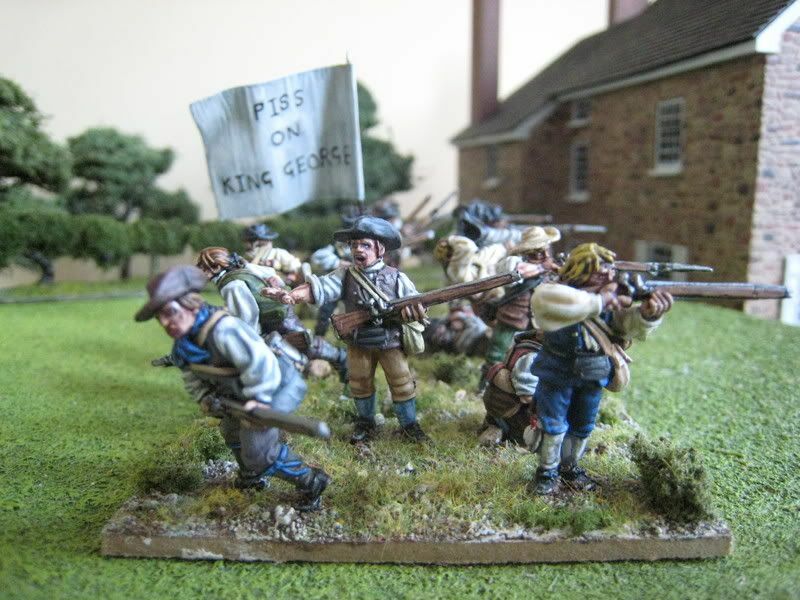 I then thought it might be fun to combine the two slogans into something that said "Piss on King George"; I quite liked the idea of such an arrogant flag being carried by a militia unit that was beginning to run away and exercise the better part of valour. I finally got around to painting the flag this afternoon. The lettering is a bit wonky, although I suppose you could explain that away as being the result of a hastily made militia flag. Anyway, it makes a change from a rattlesnake flag. I'm pleased with the way this unit turned out, hence the large number of photos! 20 figures. Painted August/September 2008. Fence from Reboubt Enterprises. 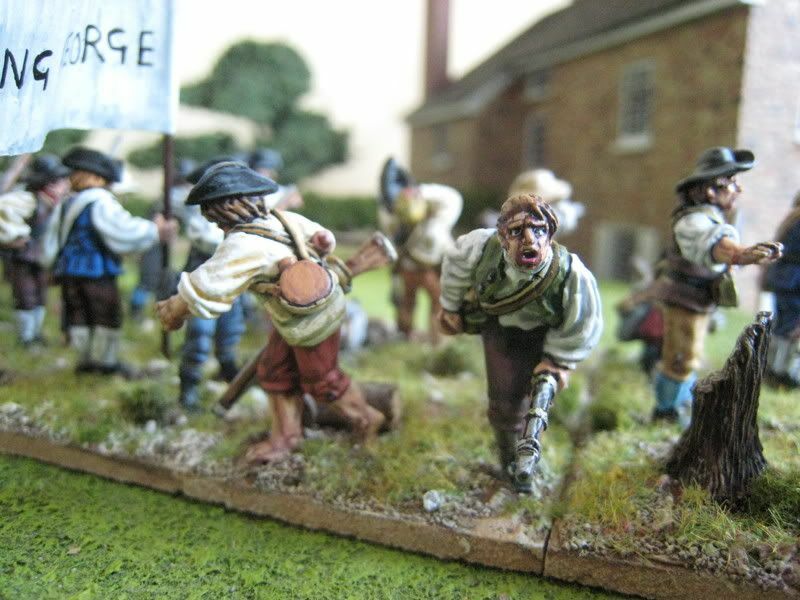 After a rather disasterous end to September, I have picked up the pace a bit, managing to paint 8 figures over the weekend in addition to finally finishing off the Hessian artillery and my last unit of Southern militia, the collapsing firing line. Above are a couple of photo of the militia. 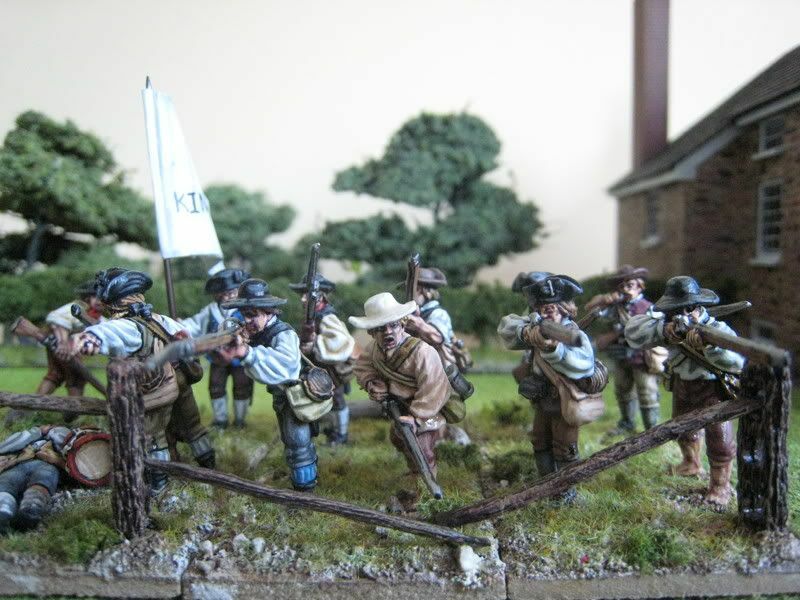 I spent a good while trying out different basing combinations and eventually settled upon a 36mm x 70mm base - this keeps the standard "British Grenadier" frontage but adds more depth so that the figures running away are more detached from the main line. The extra depth also allows me to add a ruined fence to the front of the line and tree-stumps to the rear - the fence posts are glued in place but the other bits will be very discretely blue-tacked in so that they can move around a little as the bases are placed together. 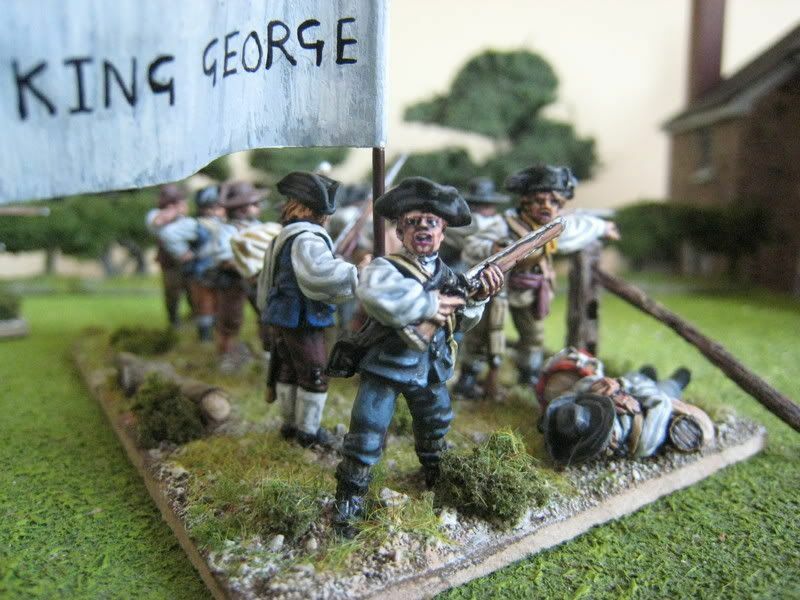 I am working on a hand-painted flag for this unit, which I hope to have photographed at some stage over the weekend. Incidentally, I hope British readers are managing to see the television series "John Adams" on More 4 (Saturdays at 5.30pm). It concentrates on politics rather than military action, but is well acted, meticulously researched and altogether quite excellent. 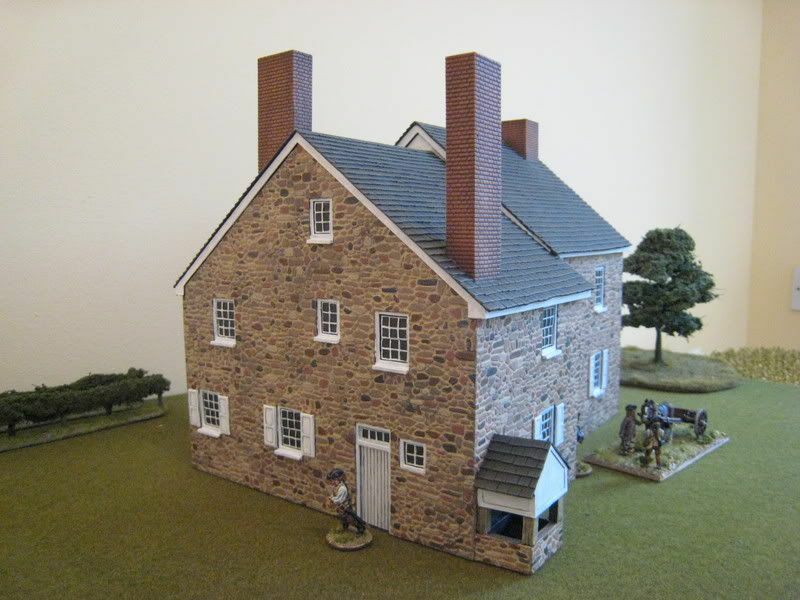 This is the model of the Benjaming Ring house from the Brandywine battlefield that Tablescape have made for me. I am incredibly pleased with it and the chaps put a huge amount of time and effort into the model. 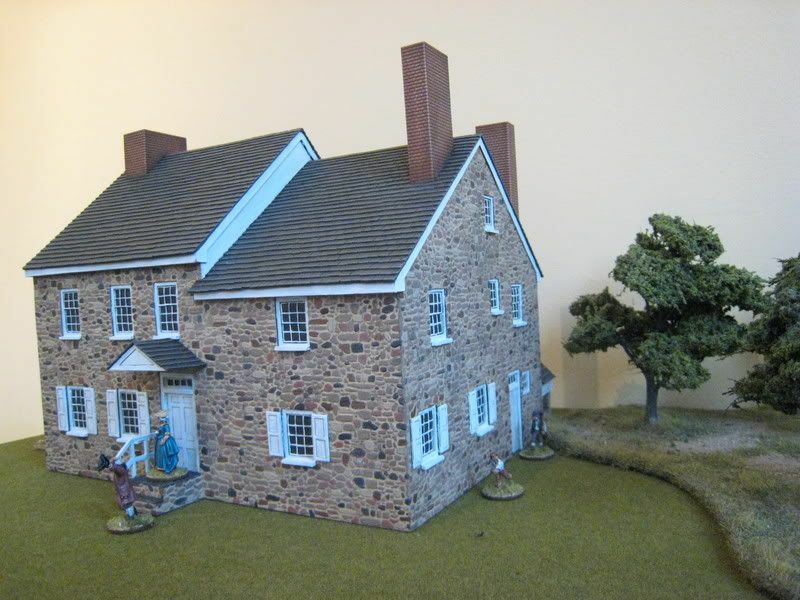 Whilst many resin models are smaller than they should be, this model gives you an idea of what these larger period houses look like "to scale". It measures about 25cm across and the same in height at the highest point on the left side. It gives you some idea of what a "to scale" Chew House would look like! Benjamin Ring was a prominent Quaker farmer and miller in Birmingham Township in Chester County, Pennsylvania. 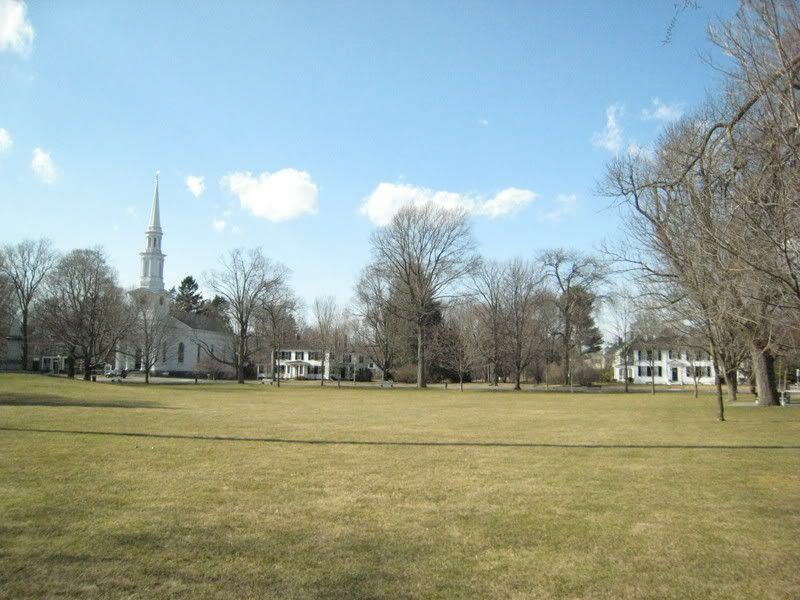 The township is thought to have been named in the 1680s by William Brinton, the first white settler known to have settled in the area, after his former home in England. 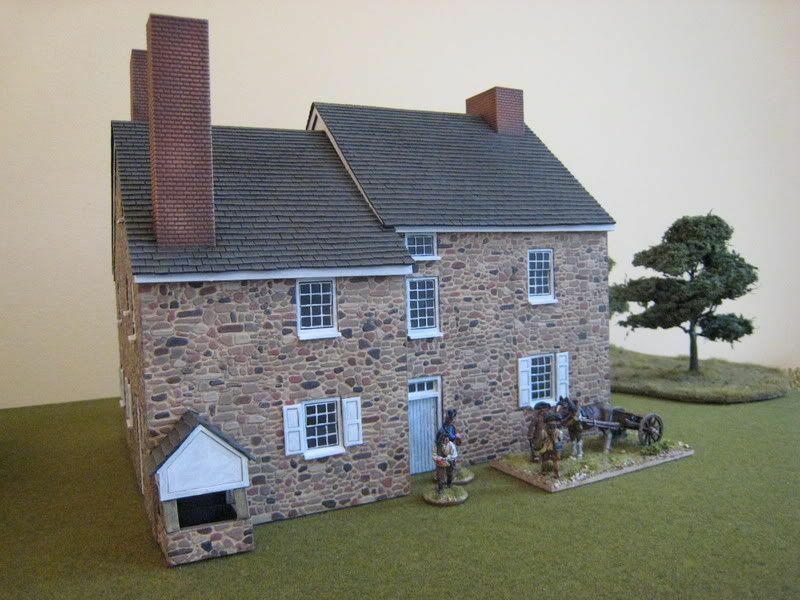 Ring owned two mills in the township and the wealth generated by these concerns allowed him to build a large house near Chadds Ford on the Brandywine. The house was built in 1731. It was all but destroyed by fire in the 1930s, resulting in a post-war reconstruction that was finished in 1952. I have not visited the battlefield and so do not know how close this house is to the river itself. Washington used the house as his headquarters on the night of 9 September 1777, two days before the battle. Some pictures of the inside of the house and some more information about Benjamin Ring are here. You can see that house (at least where it is situated now) is on a slope. We decided early on to ditch any attempts at replicating this and simply to have the house on an even level. The small piece at the back of the house on the left hand side is probably an outdoors oven, or something connected to the kitchen. Benjamin Ring is said to have hung the Stars and Stripes from one of the house's window during the battle; rather apocryphal I'd have thought... A more believable story is that on 11 September 1777 Ring stood on the porch of his house watching the battle and when advised to head indoors replied “I always put my trust in the Lord.” At that moment a round shot landed at his feet and Ring fled to his wine cellar. Apparently he ran a tavern in his cellar (one wonders the extent to which Washington's staff made use of it) and the house became a hotel in the years after the AWI. 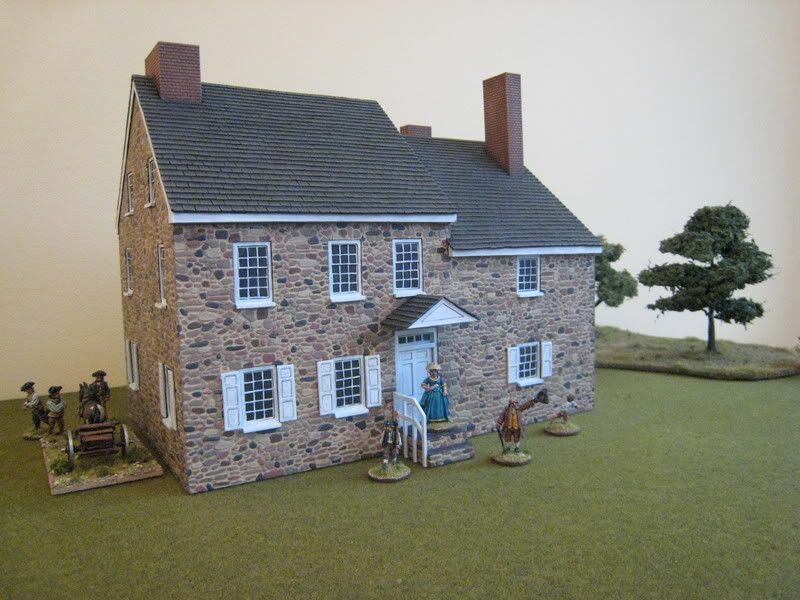 This model makes a change from the more common clapboard style of house. Stonework marked out the status and wealth of the owner, as I suspect did the large chimneys. 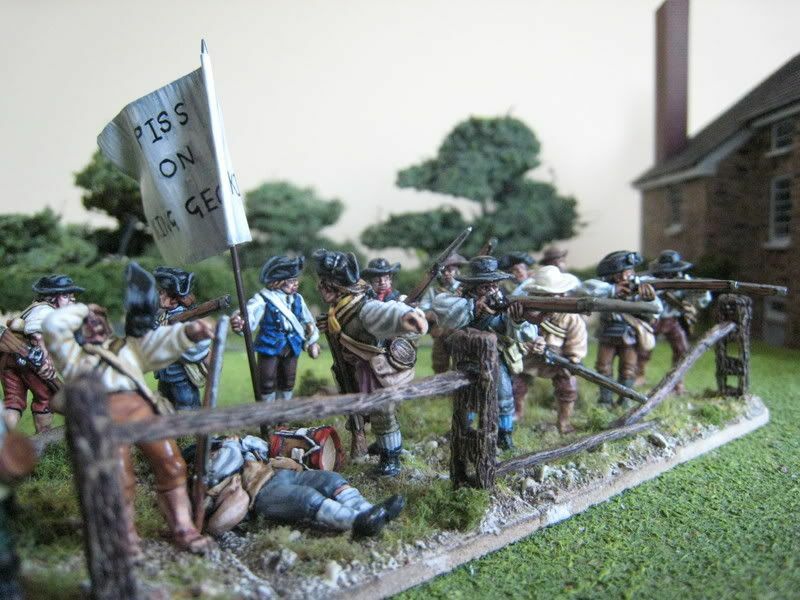 The figures in the photos are Perry sculpts and the trees are Realistic Modelling "medium" sized 25mm trees. 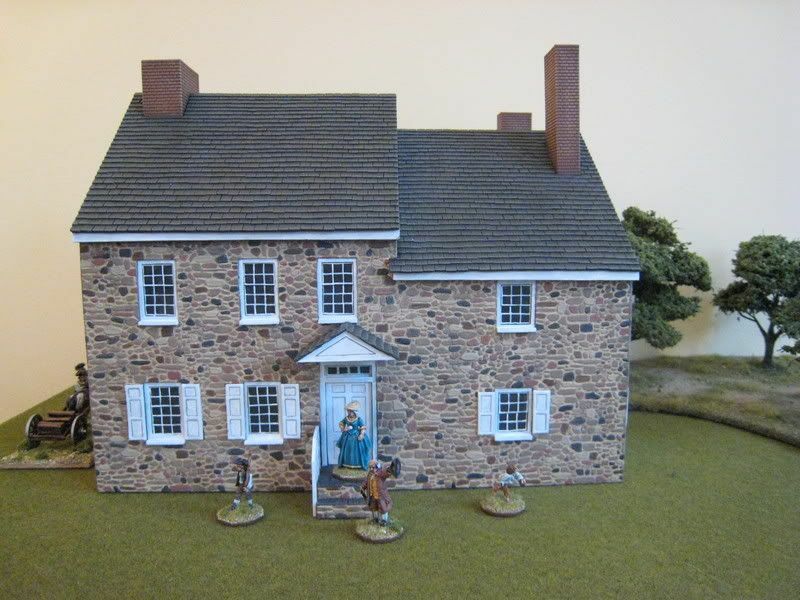 I appreciate the reasons why many wargaming buildings are often smaller than they would be in real life, but there is something to be said for an "in scale" building as a terrain centre-piece. The model cost £80 and 7 months to have made, although I think the amount of work that went into it would have justified a higher price. Please excuse the bright, artificially-lit photos - this morning was very grey and miserable here in London. The lads are currently working on a generic barn and farm outhouse for me, and I have sent them photos of the old church at Harvard for the next "real life" project. In other news, I have had a total painting collapse since the end of last week, hence the lack of any Long Island updates this week. 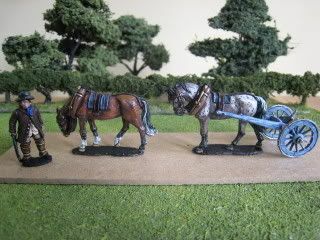 The Hessian artillery is still unfinished, so I am now officially 6 figures behind schedule. There are no photos of the von Lossberg fusiliers becuase I realised at the end of last week that I don't have their flags...So I'm relying on GMB to send them to me before the month is out!